The Suto Family donated $100.00 April 22, 2019 ... "The Sutos will be with you in spirit. Have a great ride!" Coleman Ross donated $25.00 April 17, 2019 ... "Many thanks for your (and your families) continued dedication to this." Bruce E Komarow donated $50.00 April 15, 2019 ... "Thank you to Wyatt and all of the riders"
The first time I fully realized the dangers of gun violence was Friday, December 14, 2012. It is my first memory of unspeakable violence of one person to another. It was my first recollection of the horrible issue that is gun violence. Sadly to say, this was not the first incident of its nature that our nation has seen; and even sadder than that, it was not the last. It is disheartening to see just how little has been done in terms of gun control legislation to stop the senseless killings that our country faces everyday. I ride in support of those that have lost a loved one to gun violence. I ride to show them that their loss has not and will not be forgotten. I ride for those that will never get to experience the love that cycling has brought me. I ride to show that life is more important than a gun. More and more, I see that kindness and compassion is the key to preventing more tragedies like the one that took place in Sandy Hook some six years ago. I ride to spread the messages of hope, peace, and love to all that will hear them. Terry Chase donated $100.00 April 8, 2019 ... "Good luck with the ride." Jeff and Veronica Cote donated $100.00 April 7, 2019 ... "In memory of Team Captain Dave Hoyle"
Koleszar Family donated $50.00 April 14, 2019 ... "In memory of Dave Hoyle"
Blah Blah and Pop donated $50.00 April 9, 2019 ... "We are so proud of you Wyatt! Have a safe trip." Meg & Mike donated $26.00 April 8, 2019 ... "#RideLikeDave"
Laura Summers donated $25.00 April 13, 2019 ... "have a great ride! " 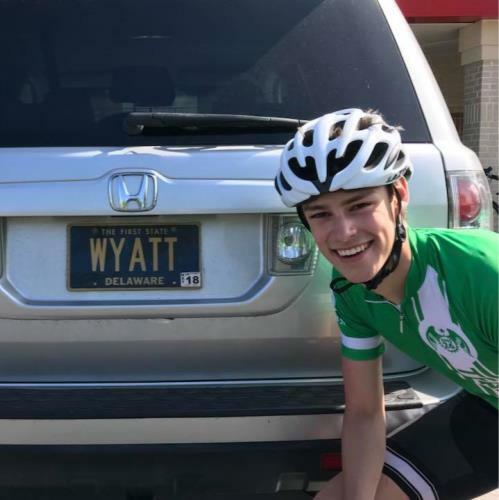 Michelle Zwick donated $20.00 April 14, 2019 ... "So happy that you’re doing this, Wyatt." Becca Jaroszewski donated $15.00 April 8, 2019 ... "Thank you for doing this! <3 Wish I could join"